Absolutely Gorgeous Proof Eagle! First Year of Mintage. Perfect PR70DCAM grade by PCGS. 100% RISK FREE SATISFACTION GUARANTEE. Until July 1, 2019. The coin you receive may have a different certification number. The razor sharp devices are beautifully complemented by the beautiful. The finest details are simply incredible–from each feather on the American Eagle, to the lines in Liberty’s hair and dress, and the features of her face. This Proof is certain to please the most discerning of collectors and investors. 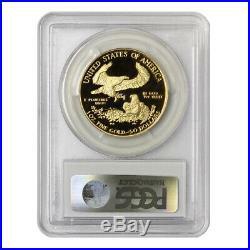 Gold American Eagles appeal to both investors and collectors alike. Minted in 22-karat gold, American Eagle Gold coins are guaranteed by the U. Government in weight, content and purity. The classic and beautiful obverse (front side) design of Lady Liberty recalls a golden age of coin artistry. Highly respected PNG dealer. With 50+ years of numismatic experience! Any comparative pricing and population values were current at the time this listing was created. Pricing and pop values are subject to change. PNG membership is an honor and privilege restricted to the world’s most highly respected rare coin and precious metal dealers. About the Professional Numismatists Guild (PNG). PNG’s Code of Ethics and Standards for membership require that PNG only accept the most ethical professionals as members. Every PNG member MUST adhere to the strict Code of Ethics and Standards set forth by PNG. Admittance to PNG is voted upon by the PNG membership. PNG Collector’s Bill of Rights (see below). A note from Barry Stuppler, PNG member since 1982, and the Founder and President of Mint State Gold, a division of Stuppler & Co. Serving on the PNG Board of Directors for the past three years, I have had the privilege of experiencing first-hand why PNG is the premier organization for Rare Coin and Precious Metal Professionals. Barry Stuppler PNG member #334. PNG member since 1982. Currently sits on the PNG Board of Directors; elected to the Board in 2009. 1982 co-founder of The Industry Council for Tangible Assets (ICTA) and current member of ICTA Board of Directors. ICTA serves as the national trade association for all dealers, collectors, and investors. The ANA is the world’s largest numismatic organization, with over 30,000 members. Current President of the California Coin and Bullion Merchants Association (CCBMA). Founded Stuppler & Company, Inc. (MintStateGold. Com’s parent company) in 1995. One of the nation’s most well known and highly respected coin dealers. 50+ year veteran in the rare coin & precious metal community. PNG Collector’s Bill of Rights. To reaffirm PNG’s commitment to collectors and the numismatic fraternity, the Professional Numismatists Guild has adopted a Collector’s Bill of Rights. This ten-point pledge of consumer protection and education puts extra security into the hands of collectors, letting them know they can do business in the way it should be done — in a professional manner and with dealers of the highest integrity, who will stand behind the merchandise they sell. The Professional Numismatists Guild is proud to present this pledge to the numismatic community. Not use high pressure sales tactics. Do our best to educate our clients or direct them to resources. Submit to PNG arbitration in any unresolved dispute and abide by the arbitrator’s decision. Take your time and check out your merchandise up close and personal and see for yourself that it is everything we say it is! Mint State Gold does not! Love it or send it back! NO hassles, NO excuses, NO delays… Allow 3-5 days to clear. Credit and Debit cards. All orders in the continental U. We do our best to accommodate special requests, however, extra charges may apply. We haven’t built our business on clients keeping coins they’re unhappy with. If you are unsatisfied with your. Or instructions for returning the item pre-paid. Bullion items are priced according to daily market rates. Sell back to us. (a division of Stuppler & Company). 5855 Topanga Canyon Blvd. 410 Woodland Hills, CA 91367. 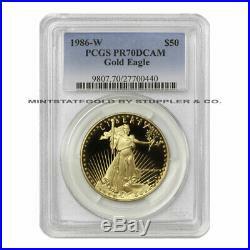 The item “1986-W $50 Gold Eagle PCGS PR70DCAM Deep Cameo American Bullion 1oz Proof coin” is in sale since Monday, October 2, 2017. This item is in the category “Coins & Paper Money\Bullion\Gold\Coins”. The seller is “verypq” and is located in Woodland Hills, California. This item can be shipped to United States. This entry was posted in 1986-w and tagged 1986-w, american, bullion, cameo, coin, deep, eagle, gold, pcgs, pr70dcam, proof.